Kiowa (/ˈkaɪəwə, –wɑː, –weɪ/) people are a Native American tribe and an indigenous people of the Great Plains. 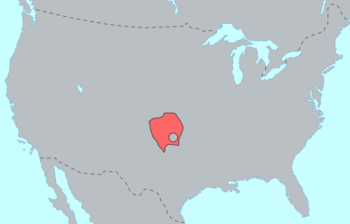 They migrated southward from western Montana into the Rocky Mountains in Colorado in the 17th and 18th centuries, and finally into the Southern Plains by the early 19th century. In 1867, the Kiowa were moved to a reservation in southwestern Oklahoma. Kiowa call themselves Ka’igwu, Cáuigù or Gaigwu, most given with the meaning “Principal People”. The first part of the name is the element Kae-, Cáui- or Gai- which means the Kiowa themselves – it may derive from the word ka' (mother) or from ka-a (a type of spear with feathers along its length). The true origin is lost. Kae-kia means a Kiowa man; Kae-ma is a Kiowa woman. The second element -gua refers to “men or people”, so the meaning of the two elements is “Kiowa people”; to express “Principal People” (sometimes “Chief People”) or “genuine, real or true People” in Kiowa is to add the ending -hin. Ancient names were Kútjàu or Kwu-da (“emerging” or “coming out rapidly”) and Tep-da, relating to the tribal origin myth of a creator pulling people out of a hollow log until a pregnant woman got stuck. Later, they called themselves Kom-pa-bianta for “people with large tipi flaps“, before they met Southern Plains tribes or before they met white men. Another explanation of their name “Kiowa” originated after their migration through what the Kiowa refer to as “The Mountains of the Kiowa” (Kaui-kope) in the present eastern edge of Glacier National Park, Montana, just south of the border with Canada. The mountain pass they came through was populated heavily by grizzly bear Kgyi-yo and Blackfoot people. Other tribes who encountered the Kiowa used sign language to describe them – by holding two straight fingers near the lower outside edge of the eye and moving these fingers back past the ear. This corresponded to the ancient Kiowa hairstyle cut horizontally from the lower outside edge of the eyes to the back of their ears. This was a functional practice to keep their hair from getting tangled while they shot an arrow from a bow string. George Catlin painted Kiowa warriors with this hairstyle. For a time, the Kiowa are thought to have shared land, mostly in present-day eastern Colorado, with the Arapaho. An Arapaho name for the Kiowa is “creek people”, and the Arapaho word for “creek” is koh’owu’, which when pronounced carefully has some resemblance to the current name “Kiowa”. For example, the Kiowa are referred to as “creek people” in an oral narrative recited in 1993 by native Arapaho speaker Paul Moss. “Kiowa” may have been a transliteration by European Americans of a name by which the tribe was known among the Arapaho. The Kiowa language is a member of the Kiowa-Tanoan language family. The relationship was first proposed by Smithsonian linguist John P. Harrington in 1910, and was definitively established in 1967. Parker McKenzie, born 1897, was a noted authority on the Kiowa language, learning English only when he began school. 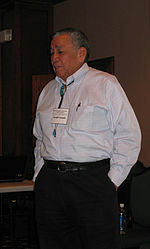 He worked with John P. Harrington on the Kiowa language. He went on to discuss the etymology of words and insights of how the Kiowa language changed to incorporate new items of material culture. McKenzie’s letters are in the National Anthropological Archives on pronunciation and grammar of the Kiowa language. The Kiowa Tribe issues its own vehicle tags. As of 2011, the tribe owns one smoke shop, two casinos, the Kiowa Red River Casino, Morningstar Steakhouse and Grill, Morningstar Buffet, The Winner’s Circle restaurant in Devol, Oklahoma, and Kiowa Bingo near Carnegie, Oklahoma. The introduction of the horse to Kiowa society revolutionized their way of life. They acquired horses by raiding rancheros south of the Rio Grande into Mexico, as well as by raiding other Indian peoples who already had horses, such as the Navajo and the various Pueblo people. With the horse, they could transport larger loads, hunt more game over a wider range and more easily, and travel longer and farther. The Kiowa became powerful and skilled mounted warriors who conducted long-distance raids against enemies. The Kiowa were considered among the finest horsemen on the Plains. A man’s wealth was measured primarily by the size of his horse herd, with particularly wealthy individuals having herds numbering in the hundreds. Horses were targets of capture during raids. The Kiowa considered it an honor to steal horses from enemies, and such raids often served as a rite of passage for young warriors. 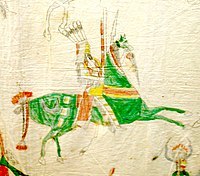 They adorned their horses with body paint from the medicine man for ritual and spiritual purposes, such as good fortune and protection during battle. Kiowa horses were also often decorated with beaded masks (sometimes with bison horns attached to the sides) and feathers in their manes. Mules and donkeys were also used as means of transportation and wealth; however, they were not as esteemed. The women gain prestige through the achievements of their husbands, sons, and fathers, or through their own achievements in the arts. 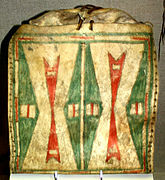 Kiowa women tanned, skin-sewed, painted geometric designs on parfleche and later beaded and quilled hides. The Kiowa women took care of the camp while the men were away. They gathered and prepared food for winter months, and participated in key ritual events. Kiowa men lived in the families of their wives’ extended families. Local groups (jōfàujōgáu or jōdáu) were led by the jōfàujōqì, which merged to become a band (topadoga). These bands were led by a chief, the Topadok’i (′main chief′). The Kogui were responsible for conducting the war ceremonies during the Sun Dance. 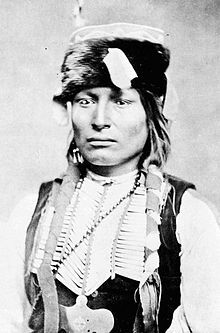 There were numerous famous families and leaders known for their military exploits and bravery, such as Ad-da-te (‘Islandman’), Satanta (White Bear), and Kicking Bird, and the war chiefs Big Bow (Zepko-ete) and (Set-imkia). The Kinep or Khe-ate were often called ‘Sun Dance Shields’ because during the dance, they observed police duties and ensured security. The chief (Manyi-ten) belonged to this band. The Soy-hay-talpupé were often called Montalyui or Kó̱tályop / Kṓtályóp / Kṓtályôi (‘Black Boys’, Black Boy Band); they were also named after the Kiowa cultural hero Séndè / Sindi and therefore called Séndèiyòi (Séndè / Sainday’s Children). To this band belonged the medicine man Maman-ti. Like the Semat, they had no specific duties or responsibilities. 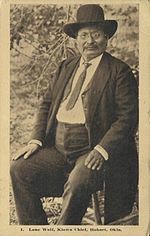 The Kiowa people told ethnologist James Mooney that the first calendar keeper in their tribe was Little Bluff, or Tohausan, who was the principal chief of the tribe from 1833 to 1866. Mooney also worked with two other calendar keepers, Settan, or Little Bear, and Ankopaingyadete, In the Middle of Many Tracks, commonly known as Anko. 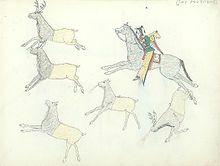 Other Plains tribes kept pictorial records, known as “winter counts”. As members of the Kiowa-Tanoan language family, the Kiowa at some distant time likely shared an ethnic origin with the other Amerindian nations of this small language family: Tiwa, Tewa, Towa, and others. By historic times, however, the Kiowa lived in a hunter-gatherer economy unlike the sedentary pueblo societies of the others. 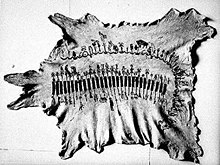 The Kiowa also had a complex ceremonial life and developed the ‘Winter counts‘ as calendars. The Kiowa recount their origins as near the Missouri River, and the Black Hills. They knew that they were driven south by pressure from the Sioux. Following A’date, famous Kiowa leaders were Dohäsan (Tauhawsin, Over-Hanging Butte, alias Little Mountain, alias Little Bluff); Satank (Set-ankea, Sitting Bear), Guipago (Gui-pah-gho, Lone Wolf The Elder, alias Guibayhawgu, Rescued From Wolves), Satanta (Set-tainte, White Bear), Tene-angopte (Kicking Bird), Zepko-ete (Big Bow), (Stumbling Bear), (Woman’s Heart), (No Mocassin), Mamanti (Walking-above), Tsen-tainte (White Horse), Ado-ete (Big Tree). 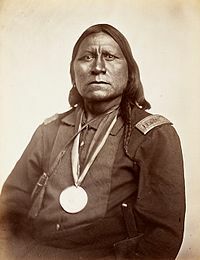 In 1871 Satank, Satanta and Big Tree (translated in some documents as Addo-etta) helped lead the Warren Wagon Train Raid. They were arrested by United States soldiers and transported to Jacksboro, Texas. En route, near Fort Sill, Indian Territory, Satank killed a soldier with a knife and was shot by cavalry troops while trying to escape. Satanta and Big Tree were later convicted of murder by a “cowboy jury”. In September 1872, Guipago met with Satanta and Ado-ete, the visit being one of Guipago’s conditions for accepting a request to travel to Washington and meet President Grant for peace talks. Guipago eventually got the two captives released in September 1873. Guipago, Satanta, Set-imkia, Zepko-ete, Manyi-ten, Mamanti, Tsen-tainte and Ado-ete led Kiowa warriors during the “Buffalo war” along the Red River, together with the Comanche allies, in the summer (June–September) 1874. They surrendered after the Palo Duro Canyon fight. Tene-angopte had to select 26 Kiowa chiefs and warriors to be deported; Satanta was sent to a prison in Huntsville, Alabama, while Guipago, Manyi-ten, Mamanti, Tsen-tainte, and others were sent to Florida, at what was then known as Fort Marion. 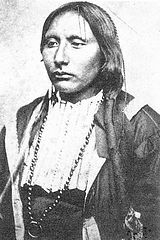 Tene-angopte, damned by the “medicine-man” Mamanti, died in May 1875; Satanta committed suicide at Huntsville in October 1878. Guipago, having fallen sick with malaria, was jailed in Fort Sill, where he died in 1879. In the early spring of 1790 at the place that would become Las Vegas, New Mexico, a Kiowa party led by war leader Guikate, made an offer of peace to a Comanche party while both were visiting the home of a mutual friend of both tribes. This led to a later meeting between Guikate and the head chief of the Nokoni Comanche. The two groups made an alliance to share the same hunting grounds and entered into a mutual defense pact and became the dominant inhabitants of the Southern Plains. From that time on, the Comanche and Kiowa hunted, traveled, and made war together. In addition to the Comanche, the Kiowa formed a very close alliance with the Plains Apache (Kiowa-Apache), with the two nations sharing much of the same culture and participating in each other’s annual council meetings and events. The strong alliance of southern plains nations kept the invading Spanish from gaining a strong colonial hold on the southern plains and eventually forced them completely out of the area, pushing them eastward and south past the Rio Grande into present day Mexico. An agreement made with the Cherokee Commission signed by 456 adult male Kiowa, Comanche, and Kiowa-Apache on Sept. 28, 1892, cleared the way for the opening of the country to white settlers. The agreement provided for an allotment of 160 acres (65 ha) to every individual in the tribes and for the sale of the reservation lands (2,488,893 acres or 1,007,219 ha) to the United States – was to go into effect immediately upon ratification by Congress, even though the Medicine Lodge treaty of 1867 had guaranteed Indian possession of the reservation until 1898. The Indian signers wanted their names stricken but it was too late. A’piatan, as the leader, went to Washington to protest. Chief Lone Wolf (the Younger) immediately file proceedings against the act in the Supreme Court, but the Court decided against him on June 26, 1901. Documentation of the history and development of contemporary Kiowa art formulates one of the most unusual records in Native American culture. As early as 1891, Kiowa artists were being commissioned to produce works for display at international expositions. The “Kiowa Six” were some of the earliest Native Americans to receive international recognition for their work in the fine art world. They influenced generations of Indian artists among the Kiowa, and other Plains tribes. Traditional craft skills are not lost among the Kiowa people today and the talented fine arts and crafts produced by Kiowa Indians helped the Oklahoma Indian Arts and Crafts Cooperative flourish over its 20-year existence. 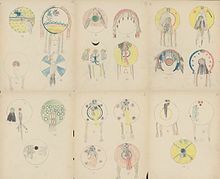 Early Kiowa ledger artists were those held in captivity by the U.S. Army at Fort Marion in St. Augustine, Florida (1875–1878), at the conclusion of the Red River War, which also is known as the Southern Plains Indian War. 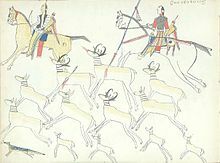 Ledger art emerges from the Plains hide painting tradition. These Fort Marion artists include Kiowas and , who was a prolific artist who chronicled his experiences before and after becoming a captive at the fort. After his release from Fort Marion, Paul Zom-tiam (Zonetime, Koba) studied theology from 1878 until 1881, when he was ordained as a deacon in the Episcopal church. Following in Silver Horn’s footsteps were the Kiowa Six, or, as they have been known in the past, the Kiowa Five. They are Spencer Asah, James Auchiah, Jack Hokeah, Stephen Mopope, Lois Bougetah Smoky, and Monroe Tsatoke Coming from the area around Anadarko, Oklahoma, these artists studied at the University of Oklahoma. 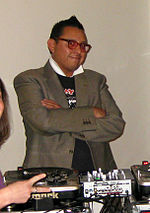 Lois Smoky left the group in 1927, but James Auchiah took her place in the group. The Kiowa Six gained international recognition as fine artists by exhibiting their work in the 1928 International Art Congress in Czechoslovakia and then participated in the Venice Biennale in 1932. 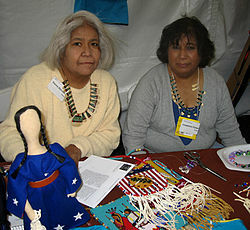 Noted Kiowa beadwork artists include Lois Smoky Kaulaity, Donna Jean Tsatoke, Alice Littleman, Nettie Standing, Marilyn Yeahquo, Edna Hokeah Pauahty, Leona Geimasaddle, Barry D. Belindo, Kathy Littlechief, Katherine Dickerson, Charlie Silverhorn, Paul McDaniels, Jr., , Grace Tsontekoy, Richard Aitson, Judy Beaver, Vanessa Paukeigope Jennings, Leatrice Geimasaddle, Teri Greeves, and Tahnee Ahtoneharjo-Growingthunder. ^ “Kiowa”. Dictionary.com Unabridged. Random House. ^ a b Kracht, Benjamin R. “Kiowa”. Oklahoma History Society’s Encyclopedia of Oklahoma History and Culture. Retrieved 21 June 2012. ^ “Kiowa Tanoan”. Ethnologue. Retrieved 21 June 2012. ^ “Kiowa Red River Casino.” 500 Nations. Retrieved 4 Jan 2011. ^ “Kiowa Bingo.” Archived October 18, 2011, at the Wayback Machine 500 Nations. Retrieved 4 Jan 2011. ^ “Kiowas”. Encyclopedia of the Great Plains. Retrieved 2013-06-23. ^ “The Kiowa Tribe of Oklahoma”. Spottedbird Publishing, LLC. Retrieved 1 August 2017. ^ Attocknie, Dana (November 11, 2010). “Kiowa Black Leggings Warrior Society”. Oklahoma Native Times Magazine. Retrieved 1 August 2017. ^ Mayhall, Mildred P. “Kiowa Indians”. The Handbook of Texas Online. Retrieved 2008-01-17. ‘^ Greene, Candace S. One Hundred Summers: A Kiowa Calendar Record. Lincoln: University of Nebraska Press, 2008. ^ a b Tanner, Beccy (2013-02-05). “Betty Nixon dies; helped found Mid-America All-Indian Center”. Wichita Eagle. Retrieved 2013-02-09. ^ “Which Indian Really Modeled?” by Robert R. Van Ryzin, Numismatic News, 1990. ^ “The Kiowa Indians”. Retrieved 2013-06-23. ^ “About the Kiowa Six”. Jacobson House. Retrieved 8 January 2017. ^ Ahtoneharjo-Growingthunder, Tahnee (Fall 2017). “Seven Directions”. First American Art Magazine (16): 16–17. Retrieved 17 February 2019. Meadows, William C. (1999) “Kiowa, Apache, and Comanche Military Societies.” University of Texas Press, Austin. ____ (2008) “Kiowa Ethnogeography.” University of Texas Press, Austin. ____ (2010) “Kiowa Military Societies: Ethnohistory and Ritual.” University of Oklahoma Press, Norman. Meadows, William C. and Kenny Harragarra (2007	)”The Kiowa Drawings of Gotebo (1847–1927): A Self Portrait of Cultural and Religious Transition.” Plains Anthropologist 52(202):229–244. US Department of the Interior (1974). “The Kiowa”. Southern Plains Indian Museum and Crafts Center. , In the Courts of the Conqueror: The 10 Worst Indian Law Cases Ever Decided (2010).